The occasional calcium deposit is considered to be relatively normal for most dogs. Dogs who exhibit signs of multiple calcium deposits often also suffer from hyperadrenocorticism, also known as Cushing's disease, which is a condition that is caused by the overproduction of glucocorticoid hormones. For the various forms of calcinosis, there is often an underlying cause which may or may not go undetected. Many dogs experience an occasional calcium deposit. Calcinosis is a condition that causes calcium deposits to occur in the skin of dogs. Calcinosis is a condition in which calcium deposits occur in the skin of dogs. The deposits can occur for a variety of reasons, most of which are non-threatening conditions. However, calcium deposits in older animals may be cause for alarm because often these deposits can signify an underlying health issue. Calcinosis circumscripta is a form of bone tumors in dogs. Calcinosis circumscripta is a form of bone tumors in dogs. Specifically, calcinosis circumscripta occurs when calcium deposits occur in protruding bones. Currently, the cause of calcinosis circumscripta is unknown. German shepherds are prone to this disease. In most cases, calcinosis circumscripta occurs in larger breed dogs. For example, the German shepherd is a well-known developer of this disease. Some dogs may develop the disease because of genetics, while others may develop calcinosis because of diet or environment. Usually, animals who are diagnosed with calcinosis circumscripta are also suffering from an additional underlying condition. For most dogs, this condition will appear prior to age 2. Fortunately, calcinosis circumscripta is considered to be extremely rare in both dogs and cats. 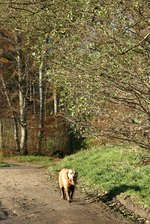 Dogs with calcinosis typically have an underlying condition. The most common signs of calcinosis include obvious hardened lumps in the skin. Lumps that are found in the foot pads, elbows or on other protruding bones may signify calcinosis circumscripta rather than just calcinosis. These lumps may have a chalky or pus-like discharge. You also may notice swelling around these areas. Other forms of calcinosis have symptoms which include hair loss, weight loss, abdominal swelling and acne in the form of blackheads. As with many calcinosis conditions, there is often an underlying condition such as various cancers or kidney disease. The most common form of treatment is surgical removal. For both calcinosis and calcinosis circumscripta, the most common form of treatment is surgical removal. Additional treatment may be necessary if the underlying cause is found. Some veterinarians also may prescribe antibiotics to treat or prevent any infections. Not all calcium deposits will need to be removed. This is because it is possible for the body to reabsorb smaller deposits. For larger deposits that go undetected, the body may actually push the deposits outward in order to rid the body of them.